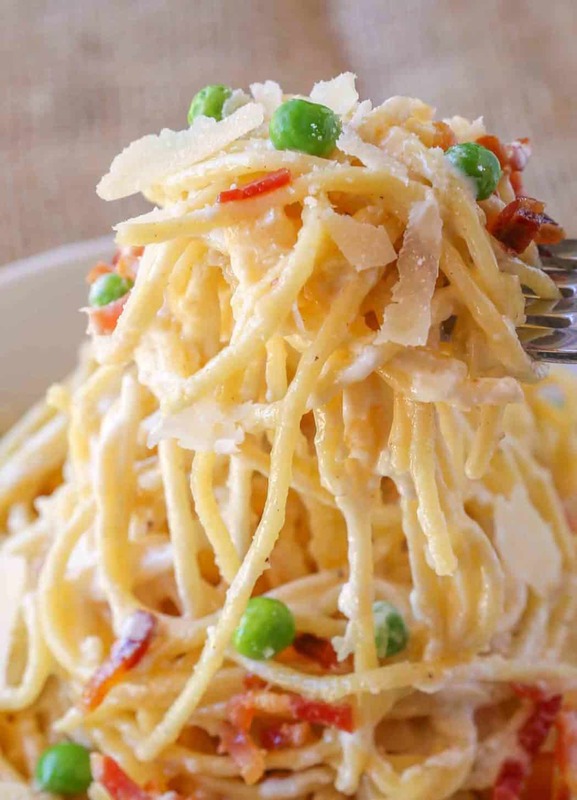 Bacon Carbonara Pasta is an Italian classic pasta dish with creamy egg sauce with noodles, pasta, eggs and bacon topped with salty Parmesan cheese in under 30 minutes. Classic Italian recipes are a popular section of recipes on the site including Meat Lasagna, Chicken Parmesan and Marinara Sauce. 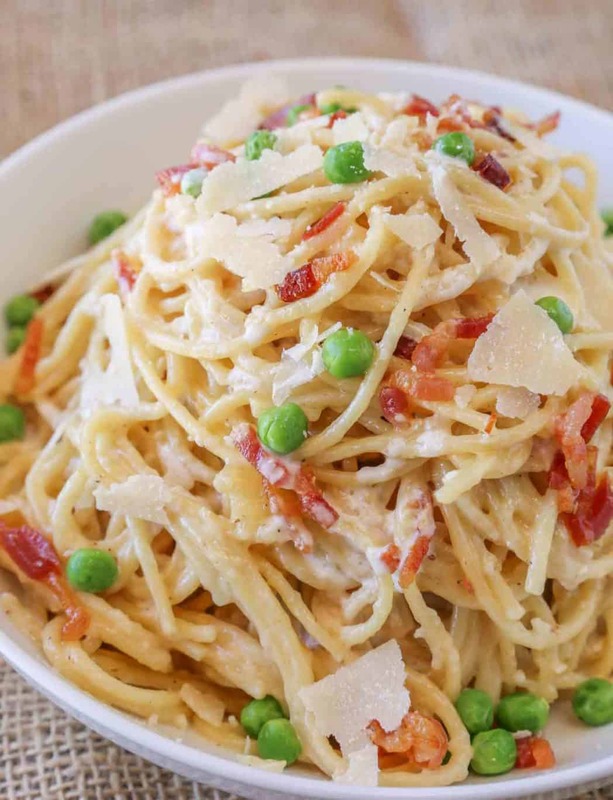 A quick and easy recipe for spaghetti carbonara topped with bacon and peas made without being intimidating! This recipe is as easy as making the pasta and bacon and tossing it together with rich egg yolks and a bit of reserved pasta water to make the creamiest easiest sauce ever. It’s like stepping into Rome, Italy with the benefit of it taking as long as a normal weeknight dinner. One of the most intimidating things about making carbonara pasta is the egg sauce. People worry about scrambling the eggs or eating raw eggs because of the heat of the pasta. Before publishing this recipe I tested it 5 times and tossed it with the eggs even taking an extra minute or so, tossing it slower or faster, trying to come up with ways you guys may approach the directions differently. The only version that ended with scrambled eggs was pouring in the eggs directly into the pan fully before tossing (which is not how the directions are written, but I wanted to test all the ways it may be carried out. Pasta water is saved for this Carbonara Pasta because the extra starch in the water from the cooking process helps to create a creamier sauce. This makes it easy to create a thick, rich sauce without waiting for anything to cook down or without adding a lot of cream or excess cheese. Remember to cook pasta al-dente, this means with a bite. I always instruct that pasta should be cooked one minute shy of the instructions on the box for this reason. As you toss ingredients together and finish the recipe your pasta will finish cooking naturally instead of becoming overcooked. If you like eating pasta al-dente I would recommend cooking 2 minutes shy of the directions before draining the pasta. This recipe shines because of its simplicity, but it also requires the use of good ingredients. I love thick cut bacon, or even high quality standard cut bacon. Use a freshly ground black pepper, the bigger the grind the more bold the flavor (shaker black pepper will hurt this recipe). 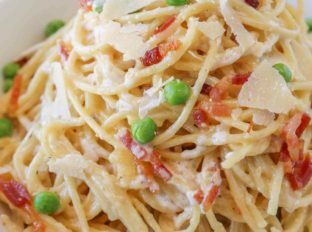 Use shaved parmesan (or Romano) instead of grated for a less gritty texture. There are many recipe variations of carbonara that are not traditional (including cream cheese or mozzarella cheese), but the traditional variety seen here including a raw egg mixture being mixed and brought to a sage temperature by the heat of the pasta. For a fully traditional option, use pancetta instead of bacon, and skip the peas. 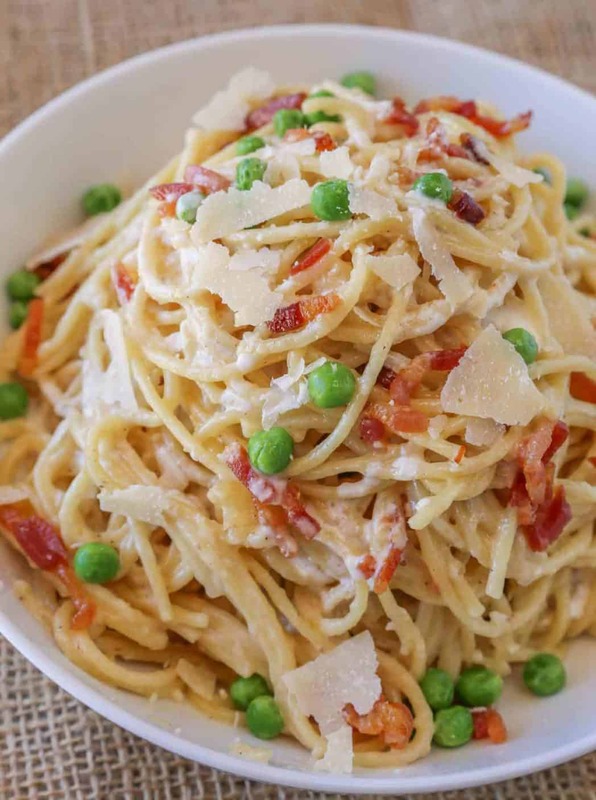 Peas: I’m love carbonara with peas, but you can certainly skip the peas. Add them in frozen as you toss the pasta they will thaw quickly. Garlic Cloves: While not traditional you can of course add them in as raw, roasted or cook them in olive oil or bacon fat first. Pecorino Romano Cheese: If you have it on hand or don’t like Parmesan Cheese, you can use Romano in it’s place. Fresh Parsley: An easy topping, but not needed as the parsley flavor will overpower the egg yolk flavor. White Wine: You can of course add this in place of or in addition to the pasta water, but the starch in the reserved cooking water helps the creamy texture of the sauce. Whole Eggs: There is never a reason to add whole eggs to this recipe, if you see a recipe call for it, I’d look to another recipe unless they call for it in the creation of fresh pasta. Heavy Cream: Heavy cream can be used if you are avoiding the use of raw eggs to create a creamy cheese sauce. 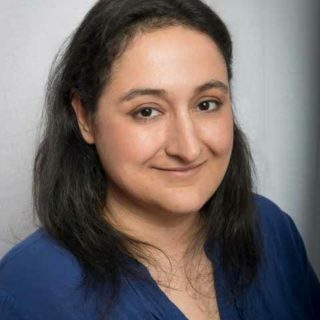 Olive Oil: No need to use oil in this recipe since we aren’t cooking anything in fat, but if you’re adding any additional vegetables you can certainly add olive oil. I would cook them in the bacon fat though. Cast Iron Skillet: This is my most used pan in my kitchen, heavy, keeps heat well. Chef’s Knife: This knife is one of the three most used tools in my kitchen. Tongs: are great for tossing all the eggs and cheese together without making a mess. Easy Bacon Carbonara Pasta with just 5 ingredients is as easy as cooking pasta and bacon and it's ready to eat in 30 minutes. A classic recipe made EASY. Cook the pasta in a large pot to one minute less than the directions on the box and keep 1/2 cup of pasta water to the side to drain pasta (do not rinse pasta). In a large skillet add the bacon and cook it until crisp then turn off the heat and remove the bacon with a slotted spoon then add the pasta and toss it in the bacon fat. Add the eggs, salt, pepper and Parmesan cheese to a large bowl and whisk well before adding slowly while tossing the hot pasta quickly to prevent it from scrambling. Add in 1/4 cup of the pasta water and peas, tossing again to create a saucy consistency to the pasta then topping with bacon before serving. Do you use whole eggs? Where do the peas come into play in the recipe? Sorry but hat is not correct. You do not use whole eggs. Only egg yolks mixed with heavy cream and Parmesan. That is what gets tossed in at the end while the fire is off!! You can do it that way as well. Enjoy! It was wonderful… Thank you for sharing your recipe… It will be my 3rd time making this dish…. My boys love it… As well as i do!…. Yay!! Love when everyone in the family loves it!! So made this tonight for dinner. We like fresh minced garlic and some sweet onion. So I put some of both in the bacon grease before I added the noodles. It turned out really good and add another layer of flavor to the dish. Finally a recipe with no cream or milk!!! Can’t wait to try it!!! I am using ground 1/2 ground turkey and 1/2 pork italian sausage instead of beef. Should I adjust any of the spices? The recipe sounds amazing. I have already made the easy marinera and will be putting the lasagna together tomorrow. I am excited for the outcome. Sorry I’m just now seeing this. I hope you enjoyed it! Fantastic!! I used to make this for my beloved husband…May he rest in peace. He worked nights, sometimes when I couldn’t sleep I would make Spaghetti Carbonaro and his face as he walked in the door and smelled it was worth the sleep deprivation. Also the best thing in the world to make when starving ‘apres amore’. What a wonderful memory! So glad you enjoyed it! This worked out great! I also added capers and some squirts of lemon… Delicious! Just bought some bacon, now I know how to use it! Yum. Mmmm! One of my favorite dishes! This looks wonderful! 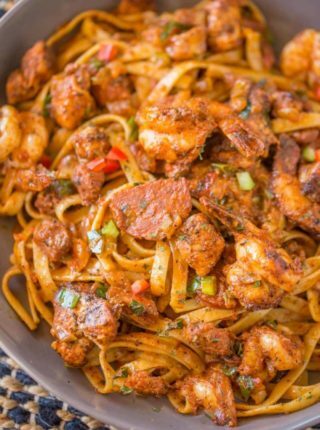 This is such an easy recipe, I can’t wait to make it soon! Looks like this will be a new favorite of mine. 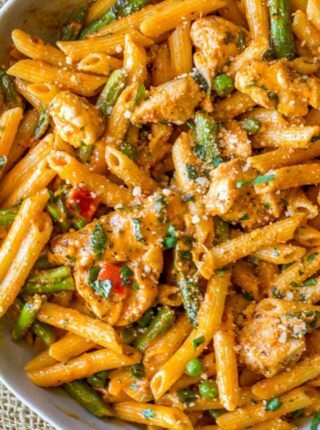 This pasta is sure to be a hit at our house! This looks so decadent! 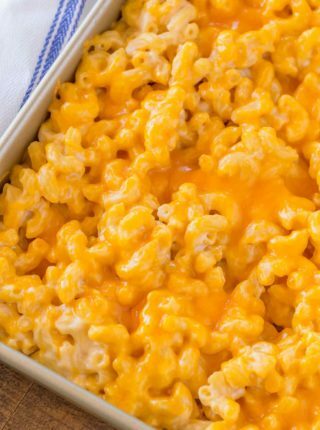 Can’t wait to try this cheesy goodness! 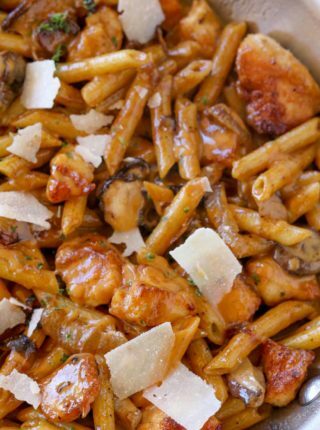 Definitely have to make this for dinner soon!